A funny thing happens early on our second morning aboard the Rocky Mountaineer train in Canada. Views that the previous day would’ve sent us all stumbling to the window with cameras held aloft suddenly seem less compelling, almost run of the mill. A glassy lake reflecting fir trees and the cloudless blue sky? We’ve seen that before. A rapidly flowing river flanked by autumnal forest? Just add it to the list. Outside the window, mist hangs low over the silvery waters of Lake Shuswap, between Vancouver and Calgary, the hills behind it golden in the early morning light. Shamed, I raise my camera, focus and click. It’s a measure of the beauty of this journey that we’ve so quickly become blase. This route, known as the First Passage to the West, will take us over two days across southern British Columbia from Vancouver into the Rocky Mountains and over the border to Alberta and Lake Louise. First Passage to the West is Rocky Mountaineer’s flagship route, and its most popular. It follows part of the historic Canadian Pacific Railway, built more than 130 years ago to connect British Columbia to the country’s east after its entry into the newly independent Canadian Confederation, which was then barely four years old. Despite the itinerary’s name — and the historical resonance of travelling west, particularly in North America — we’re headed east, having begun our journey in style at Rocky Mountaineer’s cavernous Vancouver station. This early morning send-off is a major point in favour of starting on the west coast, encompassing the old-school elegance of a jazz pianist playing a shiny baby grand, the exuberance of a pair of honeymooning passengers sounding the horn for the “all aboard” and the pomp of a smartly be-kilted bagpiper playing us on to the platform. More importantly, the eastward route allows for the remarkably diverse landscapes we pass to build in grandeur, from the farmland of the Fraser Valley to dramatic Hell’s Gate, where as much as 750 million litres of water a minute from the Fraser River surges through a gorge less than 34m wide. There are surprises, too, such as the unexpectedly arid landscapes around Kamloops, our stop on the first night. Indeed, one of the little towns we pass, Ashcroft, is often cited as one of Canada’s hottest and (outside of the high Arctic) driest spots — a place where, as the town’s official website puts it in deadpan prose, “shovelling snow only happens a handful of times each winter”. A freight train across the Thompson River near Kamloops. Passing a long freight train. Rafting on the Thompson River, near Kamloops. 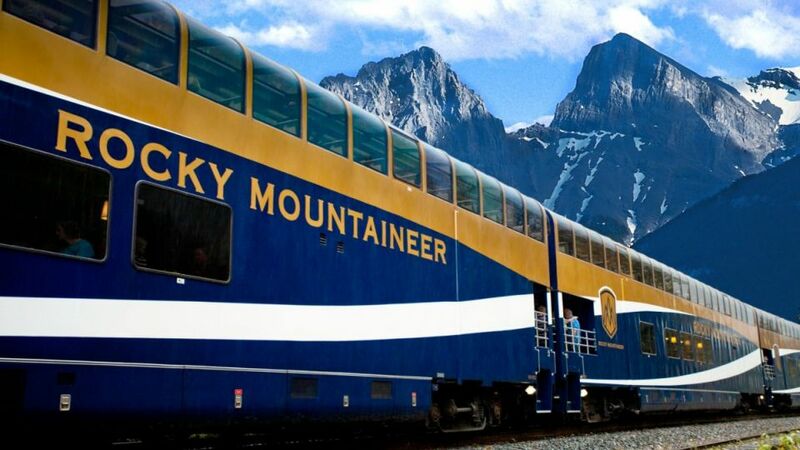 The Rocky Mountaineer is, for most travellers, synonymous with scenery. That’s why its trains travel only by daylight and are designed to optimise views, from the big windows of the SilverLeaf carriages to the two-storey glass-ceilinged domes of GoldLeaf, the ritzier class where we’re seated. Yet here’s another surprise: it’s not only about the views. It’s also about eating and drinking very well indeed. Each day at breakfast, for example, we have no fewer than seven choices in GoldLeaf — I go for oatmeal the first morning and blueberry pancakes with Canadian maple syrup the second. Our three-course lunch menus are different on both days, with a choice of four wines, two starters (generally a soup or salad) and five mains ranging from Alberta beef burgers to Canadian pork tenderloins to Pacific prawns with risotto. SilverLeaf passengers dine in their seats, but in GolfLeaf we have the small but enjoyable ceremony of descending the stairs to the dining area for each of our meals. In case we get hungry or thirsty in between, we’re served hot drinks, wine, beer and snacks such as pre-breakfast scones and cheese with crackers in our seats throughout the journey. As one of my travelling companions laments, “this train’s making me hungry”. A decadent brownie dessert on the train. Pancakes for breakfast on board. The dining area in the early morning. Dessert on the Rocky Mountaineer. On our second day on board, the grandeur of the scenery continues to grow as the track rises towards the Rockies. At Craigellachie we pass the spot where the ceremonial last spike was driven to finish the Canadian Pacific Railway, connecting the country coast to coast along its first transcontinental rail line. The event holds sufficient symbolic weight to have been the subject of Canadian books, TV series, poetry and even a board game. The completion of the railway certainly played a major role in opening up Canada’s west to European settlement and economic development, including tourism. As an early CPR president, William Van Horne, famously put it “If we can’t export the scenery, we’ll import the tourists.” But the cost of all of this was high, both financially and in human terms. About 15,000 Chinese workers were imported to work on the construction of the railway, doing the most dangerous jobs in poor conditions, often for lower pay than other workers. The often-repeated line is that one worker was lost for every mile of track laid through the Rockies, and though poor record-keeping means exact figures are elusive, hundreds of Chinese workers died. The history of the CPR is a rich and interesting one, and forms part of what Rocky Mountaineer calls the onboard “storytelling”. Delivered by our exceedingly hardworking, unstintingly genial carriage hosts Queenie and Lauren, it also touches on everything from their own experiences working on the train to, say, the wearying life cycle of the salmon that spawn in the rivers we’re passing. The latter is an epic tale, taking the fish all the way to the Pacific to mature before they swim back up river to procreate in the same place they were spawned. Their reward for these efforts is to promptly drop dead. As Lauren understatedly puts it, “it’s quite a hard life, to be a salmon”. She and Queenie are two of the six staff members — including two cooks — assigned to take care of about 70 passengers in our carriage. SilverLeaf cars carry 54 passengers, two hosts and a cook, and on this particular train of 758 guests this all translates to some 83 staff, including managers and crew such as the conductor and engineer. And though we’re only very dimly aware of it, keeping a show of this size running is a logistical feat. As train manager Barry Crawford tells us on our second morning, his job runs the gamut from taking care of special requests and requirements to mastering the juggling act of the train’s schedule — no small challenge, given we’re often sharing the rails with freight trains that stretch for kilometres. “I’m responsible for the overall operation of the train — making sure first and foremost everyone is safe, but other things as well, (such as) when the (food) service is taking place, that they’re running in a timely manner and in accordance with the way the train is running,” he says. Early morning mist over fields. Blues skies on day two aboard the train. Early snow atop the mountains. We do see a small black bear, however — or at least the others in my group do. Missing it is my only real disappointment of the trip, and comes later that day at lunchtime, beginning as a cry tears through the dining car like a shockwave. People are standing, screaming, laughing. We’ve seen eagles, big-horn sheep and deer, but this is what we’ve all been waiting for. I scan the forest floor through the window, but I can’t find it. Then I realise everyone is looking the other way: I’m seated facing backwards, so it’s the train’s left, not mine. “Did you see it,” one of my dining companions asks a few breathy seconds later. Excited chatter fills the car, and I spend the rest of the meal trying and failing to find consolation at the bottom of my wine glass. Happily, the journey still has plenty more in store for us. As the day continues, we climb into the Rockies and into that quintessential landscape of turquoise rivers capped with white foam and craggy mountains dusted with early snowfall and forests with leaves turning orange and yellow. We pass through the remarkable Spiral Tunnels, which allow us to scale a particularly steep section through Cathedral Mountain and Mt Ogden not long before we cross the Continental Divide. And then, just before we pull into Lake Louise, Yoho National Park’s Wapta Lake slips by in shades of pink and purple cast by the setting sun. It’s not a bear but as I raise my camera to take a photo, I decide that it comes a pretty close second. Among many other options, the First Passage to the West from Vancouver to Lake Louise is available as a two-day package including a night in Kamloops and as four-day package including one night of accommodation in Vancouver, Kamloops and Lake Louise. The former costs from $1574 for SilverLeaf class and from $2151 for GolfLeaf, and the latter is from $1994 in SilverLeaf, from $2729 in GoldLeaf and from $3149 in GolfLeaf Deluxe (with upgraded accommodation). Before visiting Canada, you’ll need to get an Electronic Travel Authorization (eTA) from the Canadian Government. It costs $CA7 and can easily be obtained online at cic.gc.ca/english/visit/eta.asp.